I don’t get out much but this week I got an offer of a trip to IKEA with my parents. Perhaps not very rock and roll but nights out don’t get much better for me at the moment, especially as I rarely get to spend time to talk to my parents without the input of two little people. Family bonding and lots of furniture and fabric; what’s not to love? This may be called a RÅSKOG kitchen trolley, but I’d like this grey number in my bathroom to gather up all the kids’ toys and maybe a spare towel or two. I could even see myself using the top to keep my toiletries and drink handy whilst I’m in the bath. 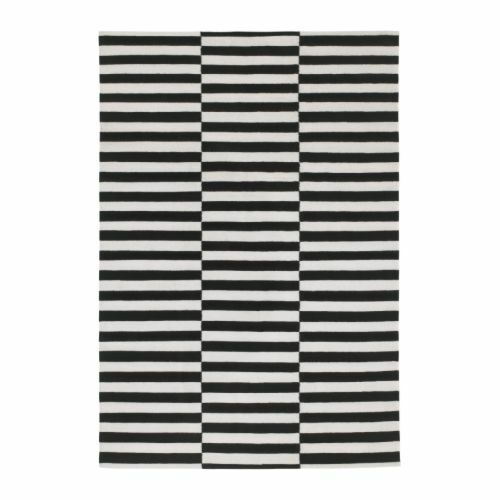 I can’t decide where I’d put this bold black and white graphic patterned RAND rug… front room? bedroom? living area? I think it would look great anywhere. We have four G Plan chairs that my friend very kindly gave to us when she emigrated but with our children getting bigger, we need fewer high chairs and two more everyday dining chairs. Few chairs I’ve seen sit as nicely alongside them as this Ikea PS 2012 chair and it would look great either end of our table. We use two beautiful Kartell Componibili storage units that we use as bedside tables and, although they may be a sleek design classic, they are not flat and my bedside lamp regularly competes for space with my water and glasses. With two of these ARÖD floor lamps, I could free up more space for my nighttime necessities and it would look better too. To break with the black/ white/ grey obsession that I clearly have (must be the British February weather), how lovely is this lilac ISALA cabinet? I don’t have anywhere to put it but I love its dimensions and the nod to the past.